Four helpful tips to make your reception memorable for decades after the last dance. Although opinions vary regarding what constitutes the best music, there are some similar elements found in all styles of music for a wedding reception that appear across the board in all genres and eras. There are also several key ways to affect the success of a party and enhance the musical experience for partygoers of all ages. Tip #1: Choose songs with a positive message and avoid those with negative, profane, or sad lyrics. Your guests are there to celebrate, so even if you think no one is paying attention to the lyrics, the party will benefit from positive, happy music. One sad or inappropriate song can wipe out the energy and excitement built by the previous 10 tunes. Positive lyrics lift the spirits of attendees and the ambience in the room, contributing to the revelry – way before the drink-per-guest minimum has been reached. This tip is particularly important for a dry wedding, since in that case the music is relied upon to generate enthusiasm. Tip #2: Pick and place your special dances carefully. Placing a bride and groom’s first dance right after their grand entrance is perfect timing. Remember that when a room full of people is watching, every minute feels much longer, for both the newlyweds and their doting onlookers. Thus, it is a good idea to shorten the song and have your bridal party, family, and friends join you halfway through to keep the momentum building – even if it is choreographed. To add a little spice, you can start with a romantic ballad and end with something more rhythmic to stir excitement and surprise loved ones. For example, open with 45 seconds of “Crazy Love” by Van Morrison, then transition into “Crazy in Love” by Beyoncé and show off those fancy moves, or start with “Beyond the Sea” by Bobby Darin and then segue into “Happy” by Pharrell Williams – this will surely get the crowd going! After the first course, redirect guests’ attention with the father-daughter dance. Brides can select a sentimental song like “I Loved Her First” by Heartland, or a fun and light tune such as Stevie Wonder’s (or Marvin Gaye’s version) “How Sweet It Is (To Be Loved by You)” or “My Girl” by The Temptations. This can be combined with the mother-son dance or stand on its own. Dancing for 45 seconds to a minute before inviting others to join is plenty of time. If the mother-son dance is set to a different tune than the father-daughter dance, it can follow the second or third course, or in the case of food stations, after dessert. Although some grooms may want to skip this tradition, most moms treasure their moment to dance with their sons at their weddings, and often have a song in mind that would be most meaningful. Discuss this with her before skipping it or randomly picking a song she may not like. While the one-minute rule still applies, if the moment is captivating and powerful, continuing for a few more seconds is sometimes best. “What a Wonderful World” by Louis Armstrong is a classic that never goes out of style. A sister can also step in as an alternative for the traditional mother-son dance with the groom. With so many types of family configurations, including brides who were raised mostly or solely by their mothers, a mother-daughter dance is unique and can create a tender moment. A song such as “Mama’s Song” by Carrie Underwood is a happy tearjerker. Don’t be surprised if loved ones surround the dance floor to feel the bond of mother and daughter during this emotional occasion. Sharing a short dance with each parent is another option for the bride. Tip #3: Utilize other elements that enhance how responsive guests will be to the entertainment. When the lights are too bright in the space, it intimidates some people from jumping onto the dance floor. Dim the lighting to create a warm and inviting vibe. Keep the volume under control. There is nothing worse at a reception than having to scream to talk to the person sitting next to you because the music is blaring. Toasts that are two minutes or less keep the party moving along nicely and guests engaged in the revelry. Informing your best man and maid of honor that you have allocated two minutes each for their respective toasts may prevent overly long speeches that can damper the vibe created by the previous music and dancing. Tip #4: Infuse your reception with energy. Starting with upbeat music and a balanced sound will win over friends and family as they enter the reception. Playing some dance tunes in between courses offers a fun alternative to sitting for 60 to 90 minutes through the entire dinner service. It takes at least seven minutes to clear a course for 100 or more guests and during that time, a short, high-energy dance set can really ignite the celebration. 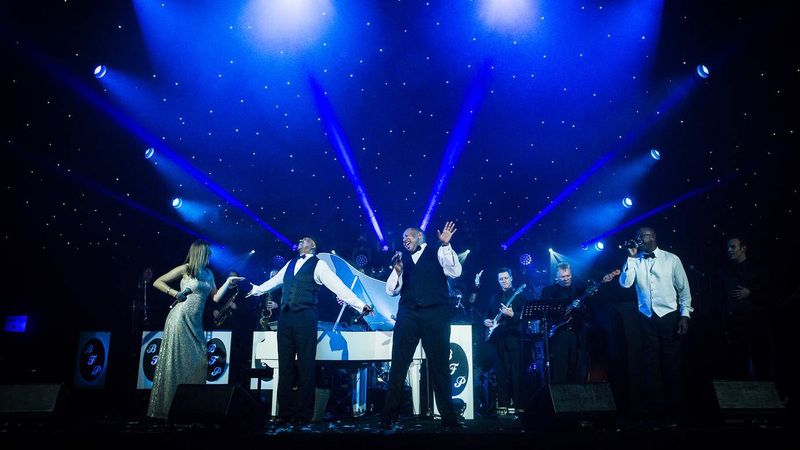 Happy, appropriately dressed, talented musicians and vocalists on stage will inspire attendees to participate in the festivities and add sophistication and style to any reception. Although each wedding playlist should reflect the taste of the honorees, there is a certain formula to help decide the remainder of the music for each segment of a reception. If followed, it ensures the music will be engaging, entertaining, at the appropriate volume, elegant, energetic, and fun, and the look will be classy and appropriate for a luxury, five-star venue. Experienced party-music professionals and entertainers know that these elements will dramatically help transform an ordinary wedding into a stellar event.